Jan-11-2017 ~ Top 5 Nominee's Announced! January 11th, 2017 (Edmonton, AB) - The Association of Country Music in Alberta (ACMA) is pleased to present your Top 5 nominees in each awards category for the upcoming 2016 Alberta Country Music Awards. Winners in the Industry Person of the Year and Talent Buyer of the Year will be announced Saturday January 21, 2017 during the ACMA Songwriters Event. All other winners will be announced Sunday January 22, 2017 during the LIVE broadcast of the 2016 Alberta Country Music Awards on Shaw TV. 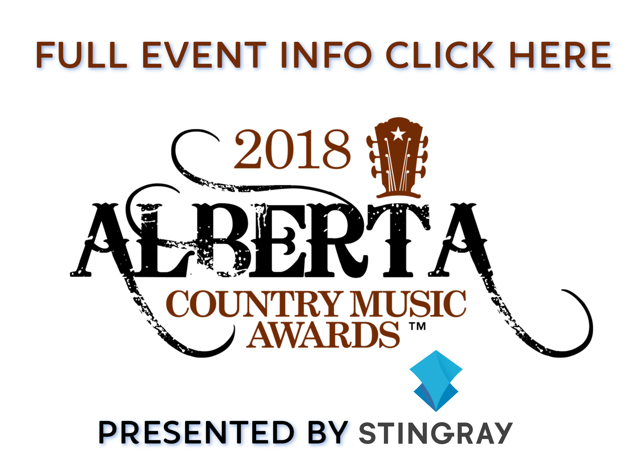 Sponsors of the ACMA and the 2016 ACMA Awards Weekend include H-Factor Productions, REAL Country 95.5 Red Deer, the Sheraton Red Deer Hotel, Ranchmans Cookhouse & Dancehall, Gilmore Guitars, Sirroma Entertainment, Calgary Stampede & Exhibition, LJVM Projects, Principle Projects, the Alberta Government, 840 CFCW Edmonton, Miller Thompson Avocats/Lawyers, Jamboree For Charity, XM105 Whitecourt, CISN Country Edmonton, Country 105 Calgary, Royalty Records Inc., and Shaw TV.